A fantastic reverb unit whose size belies its power. Great sounding vintage reverb with a very modern approach to live performance. If you like the sound of early digital reverbs, BAM has it in bucket-loads. It only has a MIDI in. 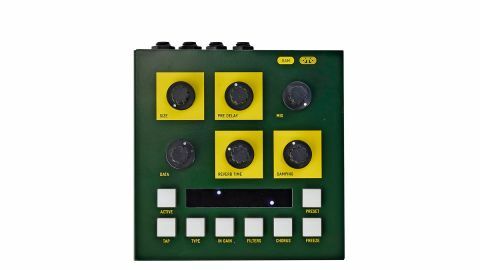 Paris-based OTO Machines is dedicated to making a small range of effects boxes with more than a tip of the hat to the early days of digital. With a great digital delay under its belt (the BIM), it was time to head into the world of reverb and the BAM is the result of many months of painstaking researching and testing. First impressions are very good. It's housed in a substantial metal box and well finished with a retro-ish design and has six knobs and eight buttons. The back panel has four 1/4-inch TRS sockets (two inputs/two outputs), a MIDI in socket and a power socket for the external power supply. The pots feel positive and smooth and the buttons are big and light up. We love the way it looks and feels - simple, functional and tactile. Looking at the knobs from left to right you have a size control which is the algorithmic equivalent of changing the physical size of the room. Next comes the pre delay (0ms to 500ms) and last on the top row, the mix control (100% dry to 100% wet). First knob on the lower row is called Data. There are four function keys which latch when you press them (you can only have one at a time) and the Data knob becomes that parameter. Type, is reverb type and there are seven to choose from. In Gain is exactly that and Filters has two parameters, High Pass and Low Pass which happen on the input stage and are stepped from 20Hz to 450Hz for the HP and 1.8kHz to 15kHz for the LP. Chorus adds modulation to the reverberated signal. Reverb Time sets the decay length of the reverb, and lastly damping sets the amount of high-end rolloff in the reverb decay. There is an Active button which is effectively a bypass but this is smarter than your average bypass as it has three modes. In Mode 1 it is like a classic bypass; the input is sent straight to the output so it cuts the reverb. Mode 2 still cuts the reverb but leaves the tail. Mode 3 is Aux mode, so the Mix control is now the reverb output level and bypassing switches off the input so you still get the decay. Very clever and obviously designed by somebody who uses this type of gear all the time. The sound of it really is like those classic earlier digital reverbs such as the Lexicon PCM60. The Tap Tempo button can be switched to either pre-delay or to Reverb Time which is another very cool feature, especially with non-linear type effects. There is a Preset button which allows you to recall and store patches and lastly a Freeze button. This loops the current buffer and disables further input to the reverb. So the big question is what does it sound like? And the answer is bloody great. It arrived on a day we were editing and manipulating sounds on a particularly experimental track so BAM came out of the box, was attached to an aux and a return and was being recorded within five minutes. The sound of it really is like those classic earlier digital reverbs such as the Lexicon PCM60, especially on the rooms, the Yamaha Rev 7 and the SPX90 for the plate, but it also has a touch of the EMT 250 in the hall and the AMS RMX16, particularly on the Non-Lin setting. The reverbs sound deep and full and with the combinations of Type and the Filters there is plenty of tonal variation. Real-time adjustment of the Pre-delay and Reverb time is smooth and without any pitch variation but playing with the Size control does sweep the pitch, and it's a very usable effect. From subtle moves to great swooping waves you can get some truly mad stuff going. The fact that all the parameters are in front of you gives you so many options in manipulating the reverb in real time that you end up playing with it a lot. Just manipulating decay length on a vocal, a bit shorter in the verse and longer in the chorus, gives a really powerful effect but, once you get into adjusting the Pre-delay, adding a touch of pitch effect from the Size or even changing the Reverb Type with the Data knob, it becomes a real performance tool. Another key question is - why digital reverb? Well, every major studio we use still has digital reverbs from the late '70s to mid '80s. Their technical limitations include extreme high-frequency filtering, limited memory and sometimes 12-bit conversion. The algorithms had to be very efficient to allow for limited memory and so the designers had to make bold decisions as to the aspects of reverberation they prioritised. The result was highly coloured, individual sounding units with a remarkable amount of spatial information. It won't suit every musical style, but nothing does. It gives you a palette of sounds you possibly can't get your hands on too easily. The different Reverb Types, Room, Hall, Plate, Non-Lin, Ambient, Chorus and Primitive have distinctive characters and in combination with the controls it's possible to find a multitude of different sounds. As a performance tool it is second to none. Those bypass modes make perfect sense and in a stripped-down track you can get into some really amazing spatial effects. The MIDI control extends to program changes, parameter changes, filters and chorus... In fact pretty much everything so, if you need to be very precise, you can automate to your heart's content. But really it comes down to this. OTO Machines set out to make a great 'early' sounding digital reverb with modern performance controls, and they have done just that. They are a small company who currently make limited runs of each item and the batches always sell out really quickly. BAM has gone onto our Studio purchases list and when budget and production runs allow we will be getting one. So keep an eye on its website and get in quick - these things fly out of the door for a reason!